Affordable Clean Carpet Service preconditions all of the carpet and extracts the water and contaminants using a neutralizing fiber rinse. Just like washing laundry you wouldn’t skip the rinse cycle would you? So you wouldn’t want to skip that when having your carpets cleaned! We include general preconditioning and disinfectant and finish with a fiber rinse. Our aim in cleaning your carpets is to restore it as close to its original condition as possible. Our cleaning methods include a pretreatment, spotting and steam cleaning. If there are heavy traffic lanes or areas that need extra attention, we will scrub to ensure the best carpet cleaning possible. (Scrubbing is an additional charge). Our qualified carpet cleaners are well trained in treating the toughest of stains and ground-in dirt. We use only the best quality environmentally friendly products for San Diego to ensure the safety and highest level of protection for your investment and our environment. 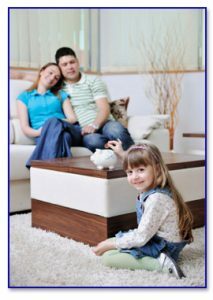 Affordable Clean Carpet specializes in rug and carpet cleaning. Our carpet cleaning process designed to rid your carpet of dirt and spots visible in your carpet. When we have completed our carpet cleaning process, you will have fresh smelling and clean carpets. Our process includes the following steps. Pre-conditioning – This step is most important to a leaving your carpets clean. Regardless if carpet is only slightly dirty or has not been cleaned for many years, pre-conditioning your carpet is extremely beneficial because we apply solutions that will break down carpet dirt and stains. Spot Treatment – If your carpet shows specific spots or stains, we will use powerful cleanings to loosen the offending substance. 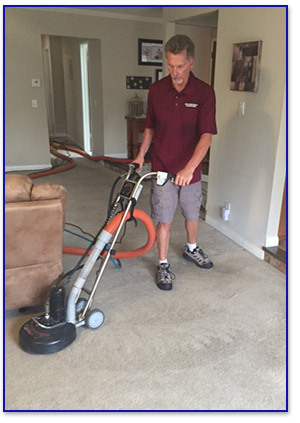 Full Carpet Cleaning – During this process, we primarily use commercial water / cleaning solution application and extraction. Our expert technicians will continue this process until they are satisfied that your carpet is thoroughly clean. Rinsing & Disinfectant – This is a critical step because it serves two purposes –removal of the dirt, stains and odors from your carpet and it ensures that no residue of the cleaning solution remains on your carpet. If carpet cleaning solution residue remains, your carpet is likely to attract dirt quicker because cleaning solutions act like a dirt magnet. Alcoholic beverages: Dilute the spot with cold water and absorb the excess liquid from the carpet. Mix 1-teaspoon mild detergent, 1-teaspoon white vinegar, and 1-quart warm water. Apply this solution to the spot and let the carpet dry. Vacuum the carpet gently. Blood: Absorb as much of the blood as you can with a rag or paper towel. Mix 1-teaspoon mild detergent, 1-teaspoon white vinegar and 1-quart of warm water. Apply this solution to the blood spot and let dry. Apply a commercial carpet cleaning solution. Vacuum gently after the carpet is dry. Butter: Do you best to scrape up as much of the butter as you can and apply a commercial carpet cleaning solution. Allow the carpet to dry. If the spot remains, repeat the procedure. Vacuum gently. Candle wax: Press an ice cube against the wax. The wax should harden and can then be pulled off. Catsup: Sponge a mixture of 1-cup vinegar and 2-cups water into rug. Frequently wring out sponge or rag until stain is gone. Chewing gum: Harden the gum by pressing an ice cube against the gum. Once hardened, pull it off. Chocolate: Immediately scrape the chocolate from the carpet. Mix 1-teaspoon mild detergent, 1-teaspoon white vinegar, and 1-quart warm water. Apply the solution to the spot. Rinse well. Vacuum gently. Coffee: Blot spilled coffee immediately. Mix1-teaspoon mild detergent, 1-teaspoon white vinegar, and 1-quart warm water. Apply the solution to the spot, and let dry. Apply a commercial carpet cleaning solution. Vacuum gently after the carpet is dry. Fruit: Fruit stains can be difficult to remove if they are allowed to set. Act quickly to prevents a permanent stain. Scrape up spilled fruit, and use paper towels to absorb the fruit juice. Mix 1-teaspoon mild detergent, 1-teaspoon white vinegar, and 1-quart warm water. Apply the solution to the spot, and let the carpet dry. Repeat the procedure if necessary and then vacuum gently. Mud: Allow the mud to dry completely and scrape off as much as possible. Mix 1-teaspoon mild detergent, 1-teaspoon white vinegar, and 1-quart warm water. Apply the solution to the spot and let the carpet completely dry. If the stain remains, apply a commercial carpet cleaning solution and blot dry. Vacuum gently. Salad dressing: Absorb as much salad dressing as you can. Mix 1-teaspoon mild detergent, 1-teaspoon white vinegar, and 1-quart warm water. Apply the solution to the spot. Let the carpet dry. If the spot remains, repeat the procedure. Vacuum gently. Soft drinks: The carbonation in soft drinks will help clean spilled drinks. Blot the spilled drink with paper towels. Mix 1-teaspoon mild detergent, 1-teaspoon white vinegar, and 1-quart warm water. Apply the solution to the spot and allow the carpet to dry. Vacuum gently. Vomit: Absorb the vomit quickly by blotting up as much as possible. Dilute the vomit with baking soda and water or with club soda. Apply a solution of 1-part ammonia to 10-parts water. Rinse with cold water, let dry, and then vacuum. Wine: If red wine is spilled on your carpet, try diluting it with white wine, then clean the spot with cold water and cover with table salt. Wait ten minutes and then vacuum up the salt.